You are in the right place... You can also keep up with us on Facebook and Instagram. There’s no arguing the fact that Yosemite National Park is easily one of the most epic places to say “I do.” From its massive granite giants and towering trees to its lazy rivers and lush meadows, there are endless photo-worthy scenes within the bounds of the park’s 3,800 acre valley. Not to mention, the endless awe-inspiring views beyond the valley floor. It’s simply the perfect venue—whether you’re after an intimate nature wedding or a backcountry adventure elopement. 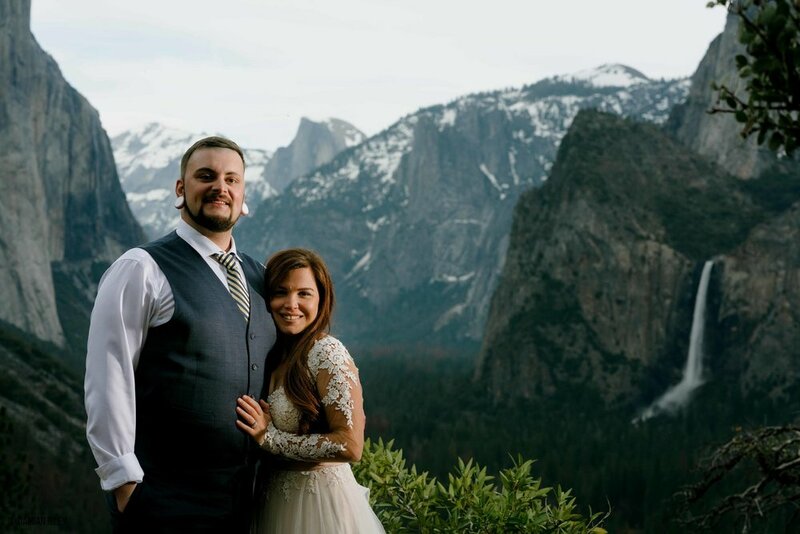 But before you send those invitations, here are some tips to help make your Yosemite wedding or elopement the very best it can be. While summer is definitely a popular choice for Yosemite weddings and elopements, nothing tops spring or late fall. Cooler weather and thinner crowds are just a few of the benefits you’ll experience during those seasons in Yosemite. Not to mention the ability to reserve accommodations more easily, whether you plan to camp, glamp, or enjoy a few nights at the Majestic Yosemite Hotel. Don’t be afraid to set your alarm a little extra early or chase the day’s last rays. Sunrise and sunset offer the most gorgeous light for capturing your intimate elopement or wedding. The images that come from early morning or evening light are well worth the extra effort (and that extra cup of coffee). 3. Dress for the occasion. This may be obvious, but if you’re gearing up for a Yosemite wedding or elopement, you’ll want to be ready for the unexpected. While your wedding shoes are undoubtedly awesome, they might not be your first choice for hiking up to that sunset spot we mentioned. So, add a more durable pair to your wardrobe checklist - any sneakers will do! And while you’re at it, have a jacket on hand. If Yosemite Valley is a comfortable 70 degrees, getting that epic Taft Point shot (for example) will mean a change in elevation and a potential 10 degree drop in temperature. You may find yourself wishing you had that extra layer in between shots! Tunnel View and Glacier Point are fan favorites for a reason: they’re host to breathtaking views! But, what many don’t know is there are many other places in the valley and beyond Yosemite Valley that offer the same jaw-dropping scene without needing to fight the crowds. This is where your photographer comes in. One of the most crucial details in planning a Yosemite adventure wedding or elopement is picking a Yosemite wedding photographer who really knows the area. 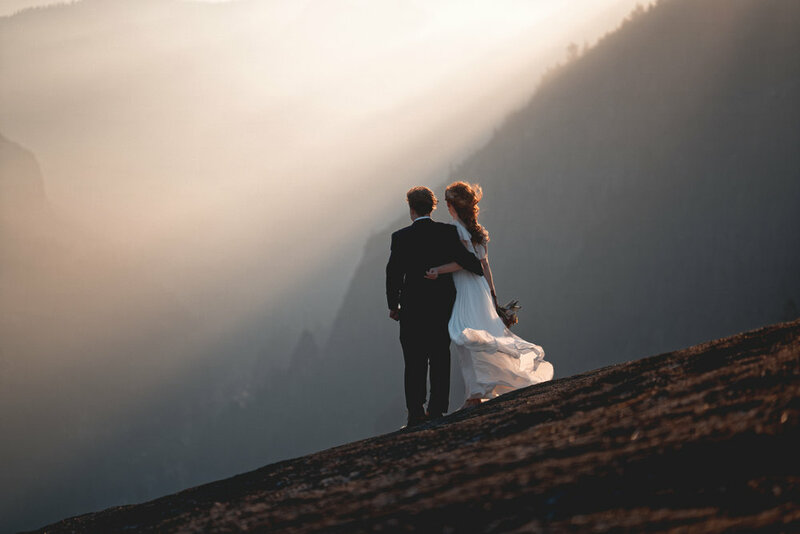 Photographers who have lived—or spent significant time—in the valley are exactly the type you want capturing your backcountry elopement or intimate nature wedding. They’re your ticket to the most gorgeous lookouts and unique locations others may be unaware of. 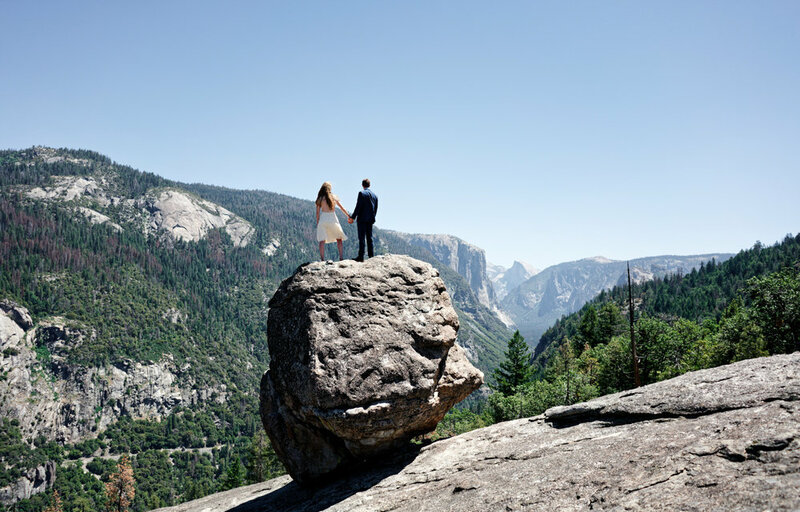 In the end, whether you find yourself in Yosemite Valley Chapel or summiting Sentinel Dome when you say your vows, it’s hard to go wrong with an intimate Yosemite wedding or elopement. It’s an incredible place to celebrate a new chapter with your partner and you’ll love wherever the adventure takes you!